Whether they're on the losing end against an act of nature or the cruelty of human infrastructure, animals can become trapped just about anywhere. Thankfully, though, there are people willing to help them out, even if that means putting themselves at risk in the process. Here are the heartwarming stories of 13 very different animals being rescued from various predicaments in just the past year. About a month ago, a leopard fell into a 60-foot well in the village of Pimpalgaon Siddhanath, near Pune in India. Although the leopard was exhausted from treading water for an extended period of time, it was still too dangerous to simply go down and pluck out of the well. Thankfully, the organization Wildlife SOS responded, led by veterinarian Dr. Ajay. First, they threw in a raft made from sticks tied together so the leopard could hold on and float while they decided what to do next. And how do you trap a cat at a distance? Use a box! Even big cats can’t resist a box, so they lowered a box with a trap door down, and the leopard took the bait. After ascertaining the leopard was in decent health, it was released into the wild. Just a couple of weeks ago, Polish wildlife photographer Krzystof Chomicz spotted a white-tailed eagle floundering in the muddy coastal flats near Swinoujscie, Poland. The bird was pretty far out, but Chomicz ventured out to it, with a safety rope attached while being monitored by local firefighters. The frightened young bird, who might have just been learning to fly, pecked and scratched Chomicz as he carried it back to shore. A wildlife rehabilitation center named the eagle Icarus and nursed it back to health. Icarus has since been sent on to a wildlife refuge in Szczecin. In July 2016, a bear was spotted near Glenwood Springs, Colorado with its head caught in a gallon-sized plastic cheese-puff container. Local wildlife officials said they received numerous reports of the bear during the previous days, but it wouldn’t stay in one place long enough to be caught. Local bed-and-breakfast owner Jim Hawkins saw the bear more than once, and when he crossed paths with the 2-year-old bear again, he lassoed it with a rope. He and the bear wrestled for a while, before the tired and thirsty animal gave up and climbed a tree. Hawkins tied off the rope so the bear could not leave, and called wildlife authorities. Carbondale District Wildlife Officer John Groves came with a tranquilizer gun, and the men snipped the plastic container off the 100-pound bear’s head before Groves administered an antidote. The bear awoke and ran away, but it is expected to be fine. Hawkins, however, required stitches for the bear claw gashes on his arm. We don’t have a lot of information about this rescue, but video shows that a group of people in Kazakstan pulled together to retrieve a dog from a flooded storm canal. A human chain of five guys were pulled up by even more at the top to get the dog out of the floodwaters sluicing down the steep concrete canal. Just a couple of weeks ago, a raccoon was found hanging from its neck in a storm drain grate in Northampton, Massachusetts, just outside the Veterans Affairs Medical Center. Northampton Police responded and removed the grate, giving the raccoon some relief from supporting his own weight with his neck. An animal control officer arrived and used cooking oil to lubricate the raccoon’s head and wiggle it out of the grate. A similar story involved a neighborhood cat in Winchendon, Massachusetts, in July. In that incident, police officers used liquid soap to free the cat. The Titirangi Volunteer Fire Brigade in Auckland, New Zealand responded to a case of trapped ducklings in the suburb of Green Bay on May 21. The mother duck stood by, quacking anxiously as firefighter Alex Justice was lowered into the drain head first, while his legs were held by other firefighters. As he pulled the ducklings up one by one, the crew corralled them in a traffic cone to keep them out of the busy road. When they were all returned to the mother duck, she either quacked her thanks to the rescuers or else gave her children a lecture—we’re not sure. The fire brigade was later honored with an award from PETA for their efforts. This past May, a goose came up to a police car in Cincinnati, Ohio, and started tapping at the door with her beak. After Sergeant James Givens and Specialist Cecilia Charron noticed the goose continuing to look at them while she was walking away, they decided to follow her. The goose led them to a gosling that had become tangled in a string that was tied to a Mothers Day balloon among the litter. The officers called the SPCA, but it would be a while before they could come. So Charron took matters into her own hands and untangled the baby bird while Givens recorded the rescue on his phone. The mother goose stood by patiently until the gosling was freed. The whole scene was unusual—Canadian geese are normally aggressive around humans, even when they don’t have goslings to protect. A construction crew near Tacoma, Washington, arrived at their work site one day in March and discovered not one, but two young black-tailed deer had fallen into a mud pit and couldn’t get themselves out. They used an excavator to gently scoop the terrified deer from the mud and, being careful not to lift the bucket too high, placed them on firmer ground. Bill Davis captured video of the incident. The second deer gave the crew a scare because she took longer to get to her feet. You can see the rescue of the second deer on video as well. This goat was just doing his goaty thing near Tempi, Greece, and the next thing he knows, he’s hanging from an overhead cable by his horns. Who knows how he got up there or how long he was hanging before a work crew came to rescue him. Giannis Goulas posted a six-minute video of the rescue effort, which involved ropes and ladders and possibly some profanity if you understand Greek. They managed to get the goat down by pulling him back toward the cliff. A calf born on Kevin Mahoney’s farm in Hope, Indiana, got into a bit of a situation when he managed to slip through the boards of a wooden fence and walk onto an ice-covered pond. Hoofs are not ideal for negotiating ice, and the 3-day-old calf got about 40 feet out on the ice and could no longer keep feet his feet from slipping out from under him. Mahoney responded to the mother cow’s distress calls and tried to pull the calf in with a rope, but it was too short. So the Bartholomew County Sheriff's Office came with a 300-foot rope, which the farmer and deputies stretched across the pond beyond the calf and pulled toward shore in order to “scoot” the calf along. The dangerously chilled calf was taken to the farm’s heated basement to warm up. The calf, since named Chewbacca, survived the incident and has become a family pet, destined to live out his natural life on the farm. In January, a tiny kitten got into a large industrial rubbish bin at a parking lot in Wolverhampton, West Midlands, UK. What’s worse, the kitten then put her head through the drain hole at the bottom and became stuck. A passerby noticed the kitten and alerted the RSPCA. Inspector Steve Morrall responded and knew that he would need more help, so he summoned the West Midlands Fire Service. The fire brigade used a small plastic collar coated with a lubricant to gently ease the kitten’s head back through the hole. A veterinarian was standing by in case sedation was needed. The kitten was then examined at a veterinary clinic and deemed healthy outside of an understandably low temperature. The 5-week-old kitten was turned over to the RSPCA, who named her Dusty and put her up for adoption. In December, a moose found itself trapped near Bathurst, New Brunswick after two of its legs slipped into the gap between the boards of a snow-covered bridge made for ATVs. By the time Philippe Doucet came along and found the animal, it had been trapped in that position for so long that icicles had formed on its legs. Doucet called forest rangers and several of his friends to help the moose. They cut two boards from the bridge and pushed the moose’s legs up from beneath. The female moose took some time to recover the use of its legs, but eventually got up and walked away. The ATV federation used the incident to emphasize to its members that spacing between the planks of a bridge should be small enough to prevent such accidents. See more pictures at Facebook. This ferret was found hopelessly tangled in a fence in Ossett, West Yorkshire, UK, last November. He had gotten caught in his midsection, but instead of backing out, he tried returning to the other side through another opening in the fence, leaving him stuck in two places. The RSPCA couldn’t free him, so they called the fire brigade. 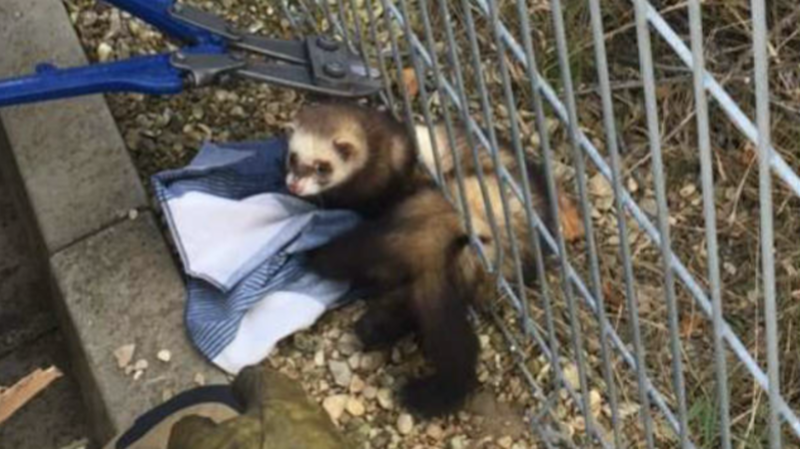 Firefighters cut a section of the fence around the ferret and took it—fence and all—to Abbey House Veterinary Hospital. Veterinarian Laura Smith freed his head from one opening, but his midsection was wedged tightly. The ferret, later named Whoops, had to be anesthetized while the doctor and assistants cut the fencing away. Once they were sure that Whoops was okay, he was sent to South Cheshire Ferret Rescue, where he was adopted.